It's the most wonderful time of the year, one marked by reunions with family and friends, seasonal snacks and holiday parties. All that merriment is enough to stress out even the savviest winter holiday enthusiasts—imagine what it can do to your favorite furry four-legged friend. If you're planning a holiday get-together, it's important to have a pet plan in place before you invite your guests in and start popping corks. Unfamiliar visitors and loud noises could cause man's best friend to act out—and even bite. Set ground rules for your guests. Let them know when and how to approach your pet—and what kind of treats are permitted. Watch for visitors to prevent excessive doorbell ringing or knocking that could rile up your pet. Give your pup a chew toy or treat to keep them busy. If your dog gets startled easily, consider giving them space—set up a quiet bedroom or basement area to play and nap. Tinsel. This holiday decorating mainstay is a big no-no if you have pets. If your dog (or cat, for that matter) swallows some, the strings can irritate the digestive track, and even cause an intestinal obstruction. Mistletoe. 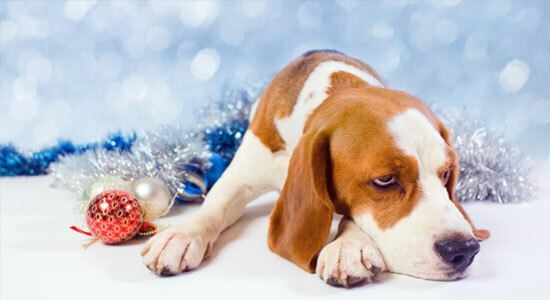 You may know that poinsettias are dangerous for your pets. Here's another one you need to beware of: It seems innocent enough over a doorway, but mistletoe, if consumed by your pet, can cause a serious medical problem like a heart arrhythmia. The Christmas Tree. If you celebrate the holiday with a Christmas tree, make sure you anchor it. If not, your pet could tip it over and potentially injure himself in the process. The Lights and Ornaments. Make sure you keep wires away from your pet. Even a little nibble can deliver your pet a serious electric shock. The Menorah. Before lighting the menorah, be sure to place it somewhere your pet can't knock it over and start a fire. Chocolate and Other Sweets. You've probably heard that chocolate is bad for dogs, but you might not realize you should also steer your pup clear of most sweets. That's because they contain something called methlxanthines, which can cause your pet to vomit or have diarrhea. In some cases, they can cause seizures, tremors and even death. Raisins and Nuts. They are popular in holiday snack trays and baked goods, but raisins and nuts such as almonds, pecans have high levels of oil and fat, which can cause your dog digestive issues such as diarrhea. Raisins—as well as grapes—can cause kidney failure. Onions and Garlic. The seasonings might make all the difference to the flavor profile of your next dish, but please note: They can also cause gastrointestinal discomfort and, in some instances, even red blood cell damage to your pet. Salty Snacks. Pretzels, chips and other salty snacks can cause excessive thirst and urination at the least, and sodium ion poisoning at the worst. Signs of sodium ion poisoning include elevated body temperature, seizures, tremors and even depression. We hope you have a safe and happy holiday—and that your pets do, too.